Things have been a little quiet in TBM-land, with work dominating far too many days, so I scanned the local events calendars and found something to do off the reservation. The Old Pueblo Archaeology Center in Tucson had organized a once-a-year tour of ancient Mogollon (native American) sites in New Mexico. I don’t usually go in for multi-day guided tours, preferring to explore on my own (or with E&E), but this was a special opportunity to visit some sites that I’d never see without a qualified guide, and to get some detailed interpretation as well. So I booked the last two days of the four-day tour (I had prior commitments for the first two days) and drove three hours from Tucson to join the group on Monday morning in Silver City, NM. Silver City is up in the higher elevations of central New Mexico, about 5200 feet, amidst rolling hills and beautiful scenery. There’s a nice historic downtown and a strong western style. The famous outlaw Billy The Kid lived here. I didn’t see any gun-slinging — these days the hotels are crowded with fire fighters, taking a break or setting up to go to the wildfires that are all over New Mexico right now. Our tour specialized in Mimbres sites, a subculture of the Mogollon. There are dozens in the area, most of which are protected as best they can be by laws, fences, and secrecy. In the past pot-hunters have devastated many of the sites, even using bulldozers and backhoes to excavate them, so many of the sites have been ruined or looted thoroughly. But those that have survived have an abundance of artifacts at the surface, primarily potsherds, pictographs, flakes of small stones, and architectural remnants like stone alignments of huts and depressions of former kivas. As tourists, we were not there to dig. At most of the sites we were allowed to pick up anything we found, as long as it was returned to the same spot. We looked, and tried to connect the little artifacts we found with the living village of people that once existed that spot. Archaeology requires a fair amount of imagination: you have to interpret the humps and dips of the land, and visualize the layout of a village that has been mostly reclaimed by the earth for centuries. The sites we visited were at least a thousand years old, a thrilling thought when you find a fragment of that ancient life still sitting on the ground for you to see and touch. 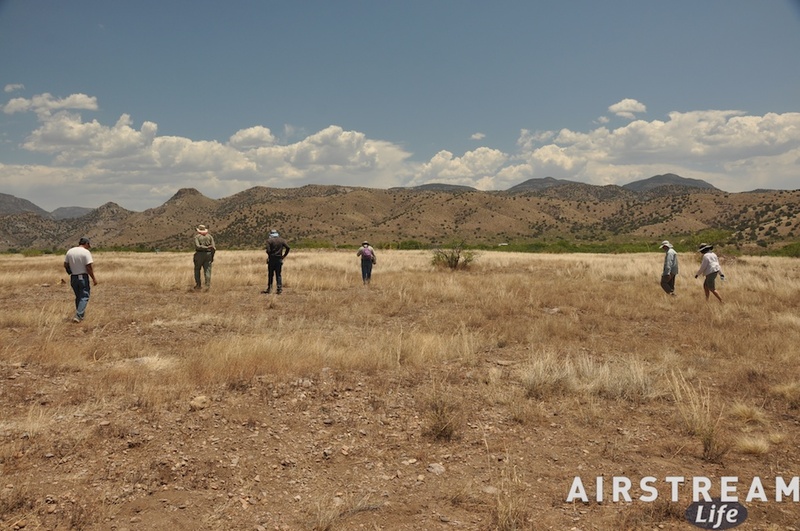 The Kipp Ruin, near Deming, was our chance to see a real archaeological dig in progress. 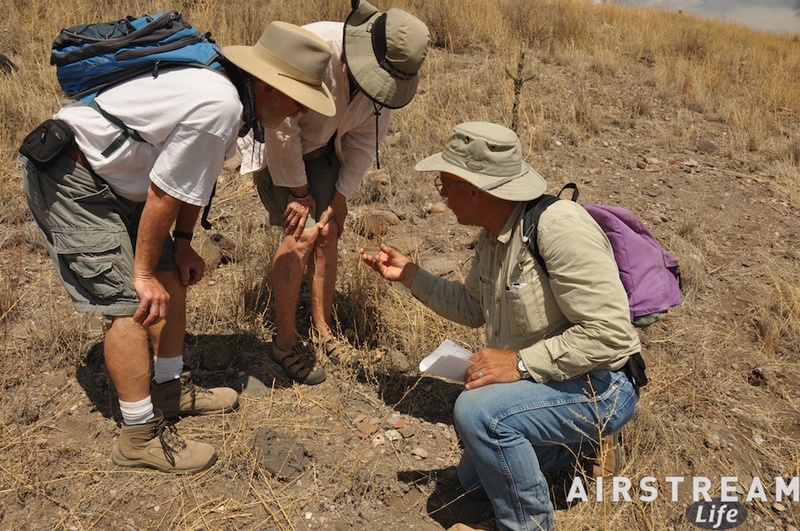 Led by Dr William H Walker of New Mexico State University, a bunch of graduate students were toiling cheerfully in the heat of the low Sonoran Desert near Deming NM, looking for tiny fragments of Mimbres culture in tidy pits dug into the earth. The work is dusty and tedious, and the results from this particular site are mostly so small that dozens of them fit into a lunch-sized paper bag. Unfortunately, the site was almost completely obliterated by pot hunters years ago, so even the stone structures were reduced to mere lines of stones less than a foot tall. Still, they were finding things, and learning, and they were happy to share the knowledge with our group. The southwest is having a little heat wave right now, so even in the supposedly cooler atmosphere of the high country we endured 100+ degree days and extremely dry conditions in full sun. When we toured the Western New Mexico University’s Museum, which had a superb collection of Mimbres pottery, there was no air conditioning. We ate our lunches outdoors where we could find shade, and we cooled off in the cars during the long drives from one site to another, but mostly the best survival strategy was the right clothing and lots of water. I went through 120 ounces on Monday, and it was even hotter on Tuesday. Still, it was worth it. A little climate challenge helped us feel less like tourists and more like explorers. The cars got dusty on long gravel roads, the people got sweaty, and the gear got dirty. I have a bag full of laundry “souvenirs” and a car in the carport that looks like it was dropped in a bag of flour, but I also have 314 photos that I treasure (54 of which are now on Flickr for your browsing pleasure). I’d do it again. In fact, I probably will do another archaeology tour this fall. 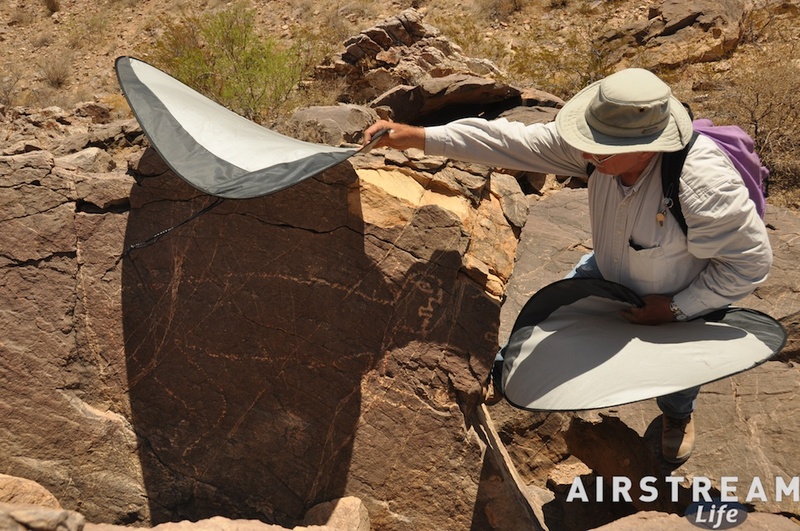 There’s a lot of incredible pre-historic culture in this part of the country, much of it very close to home, and it’s an element of the southwest that deserves exploration. Every quarter one of the hardest jobs I face is choosing the cover of the next magazine. But I’m not complaining, because it’s also one of the most fun jobs. For the past few years I have usually had several contenders competing for the cover, and that’s a lot better than the early days of the magazine when finding a cover usually meant a last-minute scramble to find something — anything — that would fit. It works better now because I’ve spent a lot of time cultivating relationships with artists and photographers who have interesting pictures, and also because the magazine is better known today. Often a painter or illustrator will come out of the woodwork with a really cool image and suggest it for Airstream Life. In the past few years the magazine has been honored to feature artists Bob Brugger, Steve Gray, Taralee Guild, Eli Clark, Brad Cornelius, Michael Depraida, and Michael Lambert, plus photographer Alison Turner. 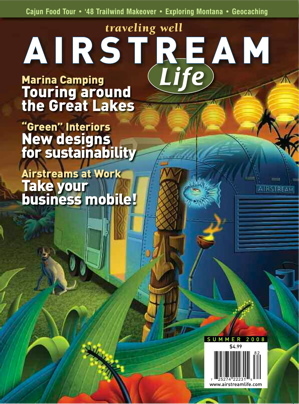 And who can forget the wonderful “Tiki Airstream” painted by Doug Horne on our Summer 2008 issue? The flip side of having a lot of possible images is that the decision process can be excruciating. Again, don’t feel sorry for me, feel sorry for the people who really wanted to be on the cover but didn’t make the cut. I hate having to give people bad news about their photo or picture. Usually the reason we pass on an image has nothing to do with the quality of the image, but rather that it just didn’t work in the context of the cover. The current issue provided an excellent example of that conundrum. I wanted to feature photography this time, because we’ve got a piece in the magazine with some of Alison Turner’s photos from Alumapalooza. She did a nice job capturing people (and often, their dogs) in the field with their Airstreams. The article in the magazine will show eight of the “characters” she photographed, with captions. I saw three or four images (out of over 200 submitted) that I thought might be cover-worthy, and eventually narrowed the choices down to two. 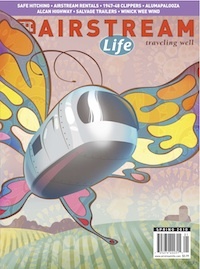 An Airstream Life cover has to be bold and visually interesting at a minimum. We almost always have Airstreams in the image (a successful exception was our Spring 2005 cover, if you remember that one). An ideal cover is evocative, or implies a story, although I’m certainly happy with images that just excite you. 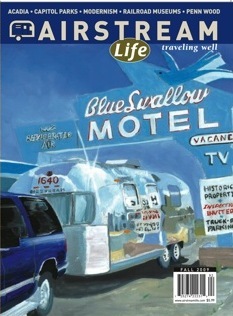 Sometimes the excitement comes from seeing a beautiful image of an Airstream in a fantastic setting, like Michael Lambert’s painting of his polished trailer at the Blue Swallow Motel sign (along Rt 66), which was featured on our Fall 2009 issue. Sometimes it is pure fantasy like the tiki Airstream above, or Brad Cornelius’ great “butterfly” logo for Alumapalooza (Spring 2010). This time I wanted to go for realism, since this issue is dedicated to the people of the Airstream community. Alison’s photos provided a great opportunity. The two photos that I ultimately chose were of Kirk MacKellar, and of Rhonda Coleman. Kirk is a good friend to Alumapalooza, who has supported us by making signs and other useful items. He has a 1967 Caravel that he has outfitted to become a “NASA Airstream” complete with decals, a stand-up cardboard spaceman, an “APOLLO” license plate, and other fun stuff. 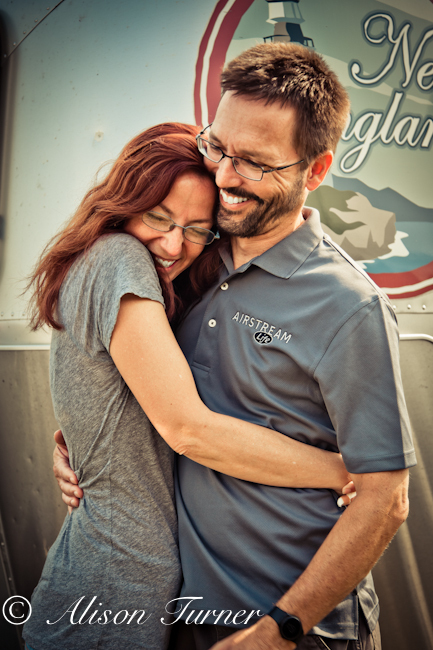 Rhonda is a blogger and occasional contributor to Airstream Life. Alison captured Kirk standing on the bumper of his trailer looking skyward (to the moon, one presumes). I thought this would be an awesome shot for the cover, and so did Lisa my Art Director, and Alison. But because we’ve been down this road before, just to be safe, I submitted Rhonda’s picture as a backup. The image above shows Kirk’s cover test. You can see why it didn’t work; Kirk’s head is scraping the logo and the whole line of his body looks awkward in the cover space. Lisa cropped the bottom edge of the image in an attempt to make it work, but that just caused the image to lose some of its impact — now you can’t see that he’s standing on the bumper. Shrinking it would be problematic, because we’d have to clone in the edges of the Airstream (fakery) or run some sort of cheezy border around the edge, which I won’t do. So, reluctantly, we passed on this image. In the past we have cloned in bits of sky or foreground to make a landscape (wide) image into a portrait (tall) one. But when we do that we always get the permission of the artist first, and they get to approve the final result. We did this for Summer 2008, Fall 2010, and one or two others. I don’t like to do it but sometimes it’s the difference between having an awesome cover or not. In the case of the current issue, we had the backup image, and it tested very well. So Rhonda gets the cover, and Alison wins either way since she took both photos. Kirk, by the way, took the loss with good humor, commenting it wasn’t his “first brush with sexism.” I do have to admit Rhonda looks pretty good on the cover, and I hope that when it comes out in August, you’ll agree. It’s a good thing I wasn’t born earlier in the Industrial Age. I might have ended up as a factory worker, and I’m not good at doing the same thing repeatedly. My tendency is to take on a challenge, master it as best I can (which may or may not be very well), then move on to something new. It’s that same aspect of personality that makes traveling and exploring new places a necessary part of my mental diet. Occasionally this personality trait becomes a problem. 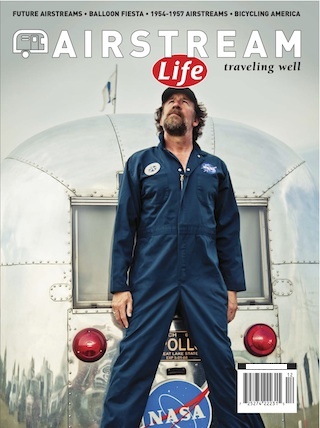 Case in point: I have been producing Airstream Life magazine for nearly eight years. Prior to this, my longest employment at anything was about five years. I definitely have a sort of seven year itch that means it’s time to move on to new challenges. In the past year or so, the itch of self doubt has crept up my sleeve like a little spider, telling me that it is becoming time to find someone to take over as Editor. I’ve mentioned this before, but the spider is reaching my neck and it is becoming less ignorable. Today I found myself wrestling to focus on the laptop yet again to finalize articles and make editorial decisions I should have made weeks ago. My email Inbox, normally kept lean as a result of compulsive housekeeping and fast response time, is filled with unevaluated writer queries and article drafts for future issues. For me, failing to deal with the routine tasks is a sign of burnout. Well, there was no chance of finding someone to do my work today, so I put my head down and got serious about dealing with the unresolved questions and unedited articles for the Fall 2011 issue. Of course, there were no really insurmountable issues, just a series of tough decisions and thoughtful editing processes that had to be done, and once I got into it the work began to fly by as it always does when I’m in the groove. By 1 p.m., after about six hours of fairly intense work, the Inbox was halfway cleared out and I had three more articles uploaded to the FTP site and ready for layout. Suddenly things weren’t so bad, and I found myself thinking that I don’t really need an Editor — just a little less procrastination. At that point I had to bail out of the office, because it was time to get into another long-dreaded task: the eye exam. I don’t normally mind eye exams, but this one was special because I knew I would be prescribed progressive lenses for the first time. I suppose I am lucky to have held out to my current age (my AARP card is only a couple of years away, despite the common misconception that I am much younger – it must be the juvenile behavior). But that doesn’t make it any easier to suffer the indignities of day-long dilated pupils, and having to learn how to compensate for lost peripheral vision by turning my head as if I am an owl. Now with the new lenses I can see the wrinkles on the backs of my hands, and I can’t see the cars in the sideview mirrors. Yes, now I can read the menu in a dim restaurant again, but somehow it doesn’t seem like a great leap forward. In comments on my prior blog entry, I was asked why I’m not planning to tow the Caravel with the old Mercedes 300D. I suppose it is time to confess: I sold it. I know I said I would keep it “forever,” but then a guy from Connecticut showed up desperately seeking a rust-free 300D, and he made an offer I couldn’t refuse. The car and I didn’t have a pre-nup, and I had already stored it for the hot summer, so I took the cash on the rationalization that (a) I wouldn’t miss the car for several months; and (b) if I kept it much longer I’d probably dump another $2k into perfecting it. Selling it was a way to save me from myself. But now of course, I’m wondering if that was the brightest move, since I’m here in Arizona, the Caravel is in Texas, and I have no way to get it back. So I’m on the hunt for a new part-time tow vehicle. I want something fun to drive, since the vast majority of the time the car will be unhitched. (Please don’t suggest any form of truck, SUV, or full-size car — I don’t regard those as “fun to drive.) The final choice will undoubtedly be something most people would never choose, require custom engineering, and be entirely safe for towing the Caravel despite appearances. It might be vintage or modern. It will likely be a convertible (but not the Miata) or two-door sports coupe. I’m having fun with it. I thought I had no theme when I started writing tonight, but now I see I do. It’s all about change. Some of it is forced on me (eyeglasses) but most of it is my own doing. There are some core elements of life you never want to change because they are the basis for one’s security and self-confidence, but the rest is all small stuff. It’s just a car. It’s just a job. I don’t ever want the fear of change to be ruling factor in my life. You can’t avoid it anyway. I’ll take the good and the bad and trust that somehow it will all work out more to the good, in the end. After a pleasant few days in Vermont, I hopped a plane and headed back to Tucson for some summer heat. It was cool and rainy in Vermont most of the time, so cool that we had to run the furnace in the trailer during the day sometimes, and I realized that once again I had not packed enough warm clothes to survive a Vermont June. I had to borrow a sweat jacket from my mother just to survive the evenings. The Airstream is parked in its summer holding pen, beneath the cedar trees on the gravel driveway next to the garage. It will rest there for a couple of months before I fly back up and collect it, along with the members of my immediate family who are spending the summer in Vermont. (You know who they are.) I am hoping that the bits of white filiform corrosion that started along the edges and trim on the Airstream a few years ago won’t greatly accelerate in the damp environment up there. Each year the tiny white spider-webs of corrosion seem to spread another 1/8″ of an inch or so. Once returned to dry conditions, it stops spreading but the damage is irreversible. Parking by the oceanside really kicks it into high gear too, but I’m not prepared to give up camping by the beach for anything. 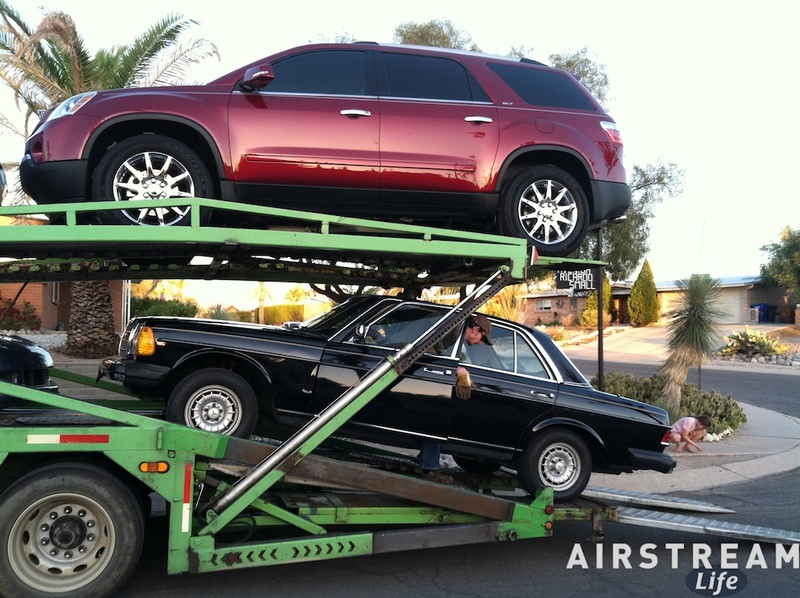 I flew back to Arizona, which means I once again am stuck without a tow vehicle. The Caravel, you might recall, was left in Texas a couple of months ago, after I attended the LBJ Grasslands Vintage Rally in Decatur. Fellow Airstreamer Paul Mayeux has been holding it at his shop ever since. He did a few repairs and tweaks for me in the meantime. Now I’ve got to figure out how to get it back, because I’d like to use it sometime this summer, which means I’m going to have to find a tow vehicle. All I have is a Honda Fit, which (despite being a very useful and versatile car) can only move itself. But first, the urgent stuff. Temporary Bachelor Man (TBM) is BACK! Armed with his cunning, a credit card, and a freezer full of food left by Temporary Bachelorette Woman (TBW), he will somehow navigate urban Tucson in the blazing heat of summer and survive to tell the tale. And you’ll be the witnesses. First mission: re-boot the house. Although preparing a house in Tucson for vacation is not very difficult, there were still a number of things to get back in shape once I arrived. Light the water heater, turn the air conditioning on (it was 92 in the house and took seven hours to cool down thanks to massive thermal mass in the adobe blocks), sweep up the dead bugs (few), add water to all the dried-up drains, check on the plants, plug in the essential bachelor electronics, check the car tires, wash the dust off the car, and go to fetch the nutritional food pyramid of TBM (frozen desserts are at the top). OK, that’s all done. Now to fill the long quiet days of a man left to his own devices. Without a definite plan of things to do outside the house, there’s too much risk that I’ll spend all day inside working, and that’s the kind of routine that turns TBM into Temporarily Psycho Man. There are several good events calendars for Tucson online, plus favorite haunts like The Loft Cinema, Mt Lemmon, and Saguaro National Park that all have regular events. (Mt Lemmon seems to be off-limits at the moment due to the danger of wildfires, but with the start of monsoon season approximately July 4, that ban should be lifted. There are no fires up there and no smoke of any of the Arizona fires can be seen from Tucson at this point.) Browsing the events calendars gives me a few ideas of TBM-worthy events to visit and possibly photograph. Events featuring food usually rise to the top of the list. I have three weeks in my present guise, and then TBW arrives and we change identities again, this time into the “Kid — What Kid?” couple. We did this last year and it was amazing. For three weeks in July we will be utterly childless, while Emma is engaged in summer camps and grandparent-spoiling up in Vermont. We’ll go roam around Arizona with a very loose plan, and if I’m able to get it worked out, we’ll even have the Caravel to do some of it in. So really I’ll be spending a fair bit of my TBM time planning for the next phase, but that’s OK. I see adventure ahead, and that’s what really makes it work for me. Let the first phase of summer begin! We are at the end of the line, for a while. From home base in Tucson, the Mercedes has hauled the Airstream across desert, plain, and mountain to end up in Vermont. Except for our week at Alumapalooza and two days in Toronto, we never even unhitched. Now the Airstream is backed into its summer parking space underneath the cedar trees and the Mercedes is sitting next to it. I think I heard a sigh of relief from the car as it was finally released from its harness. The trip through the Adirondacks is always nice. We’ve established a path that we follow from the NY State Thruway, northeast along Rt 8 and eventually to a crossing of Lake Champlain at Crown Point. I think we’ve towed the Airstream this way at least three times, and it has never failed to rain at least part of the trip, but regardless it is always a beautiful winding drive through the forests and tiny hamlets, and alongside fast-running scenic rivers. Along this route you pass over the Hudson River while it is still a moderately-sized flow, and through towns with curious names like Speculator. It takes hours to pass through the massive Adirondack Park, even if you aren’t tempted to stop at the village ice cream stands or park next to one of the many delightful clear-water lakes. Best to take your time and enjoy the scenery. The new bridge over Lake Champlain is still under construction, so the states of New York and Vermont are still running a free ferry from Crown Point NY to West Addison VT. 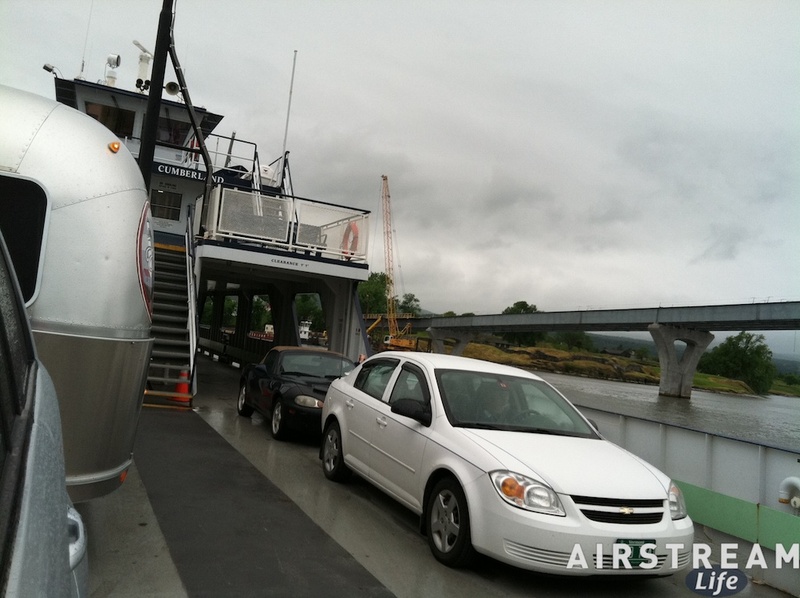 In the photo you can see the Airstream and the blue Miata taking the ride, with the bridge under construction in the background. When we arrived it was 55 degrees and raining lightly, as it had been most of the day. As I write this, a thunderstorm is overhead. We’re running the furnace. This is June in Vermont — equal parts cold/damp, and hot/humid. You can never be sure what to expect, but we know that it’s likely we’ll arrive and need an extra blanket on the bed for a while. That’s definitely the case today. Such a contrast from where I will be heading in only a few days. Tucson is expecting 104 degrees later this week, and typically the humidity runs in the single digit percentages. I can deal with that a lot better than the constant dampness that afflicts us in Vermont in June, so while the thought of 100+ degrees every day might horrify many people, I’m looking forward to it again. I won’t miss the mosquitoes. The record rains have produced record mosquitoes. This morning at the Delta Lake State Park campground’s dump station I was doing my mosquito dance again. While trying to fill the water tank I was so thoroughly swarmed that I finally gave up until Eleanor could come over and run interference for me. Like a fighter group surrounding an aircraft carrier, she provided protection from aerial assault while I completed the mission. Many of the nuisances were mashed in mid-bite, and I wore the mark of squashed bug remains on my ankles for a while. A few mosquitoes slipped into our cars too, for a few final nips as we drove. I still need to check the GPS for the final tally, but I believe our trip has covered something over 2,500 miles. We had no mishaps, no tire failures, no breakdowns (other than the Check Engine light on the Mazda, which turned out not to be serious) — really nothing to report in the way of drama. In fact, we made a few small improvements along the way, and with quick stops and friendly visits we managed to make a long driving slog into something pretty fun. It was a good trip, which makes me want to consider a slightly indirect route back home this September. By the way, I want to show you this picture of Eleanor and me at Alumapalooza. It was taken by our official Alumapalooza photographer, Alison Turner. Alison is one of the most talented photographers I know, and a real joy to hang out with, too. Whenever I can, I use her photos in Airstream Life because she imparts such magic to her images. She has done a cover for the magazine and illustrated several articles. I’m sharing this photo because I think it shows how she can take a fairly ordinary request (“take a picture of us, please”) and turn it into something really special. This photo means something to me because it was taken at the tail end of Alumapalooza, when we were tired, stressed out, and sweating in the humidity. By all rights we should have been cranky with each other (and in past years after an event we have been), but this year felt a little different. The photo captures how we really felt: happy to be together despite all the challenges. Life hasn’t gotten any less complicated, but perhaps we’ve gotten better at seeing what’s really important. I don’t know. For me at least, Alison captured all of that in one frame, and that’s why I like this picture.